Shiny Lunatone in game: 54 Who? Important notice! 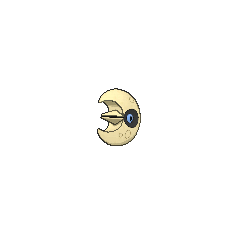 Pokemon Shiny Lunatone is a fictional character of humans. Lunatone (Japanese: ルナトーン Lunatone) is a dual-type Rock/Psychic Pokémon introduced in Generation III. It is not known to evolve into or from any other Pokémon, but it is considered to be a counterpart of Solrock. 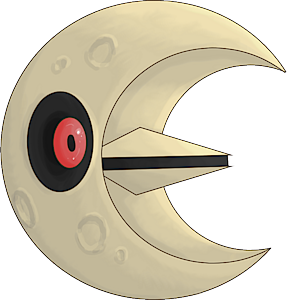 Lunatone is a cream-colored, rock Pokémon with a crescent moon shape. In the center of the crescent is a pointed, beak-like structure. It has deep-set, red eyes, which can cause paralyzing fear or induce sleep. It lives in caves, and becomes active under a full moon. The moon increases its power, and its health is tied to the lunar phases. Using its psychic powers, Lunatone floats through the air. It was first discovered at the site of a meteor crash. A Lunatone appeared under the ownership of Liza in It's Still Rocket Roll to Me! and Solid as a Solrock. Lunatone first appeared in the main series in Crazy as a Lunatone. A pair of thieves calling themselves the Pokémon Mystery Clubwas after it due to wanting to get their hands on another outer-space Pokémon. Lunatone made its debut in the opening of Destiny Deoxys. A Lunatone appeared in the opening of Lucario and the Mystery of Mew. A Lunatone belonging to a Coordinator appeared in Dawn's Early Night!. It was used along with a Solrock for the Double Performance required during the HearthomeContest. An engraving of a Lunatone appeared in Bucking the Treasure Trend!. A Lunatone appeared in the opening scenes of Zoroark: Master of Illusions. AG087 Lunatone Ash's Pokédex Lunatone, the Meteorite Pokémon. Lunatone is believed by some people to have come from outer space. It moves around most actively during full moons and its powerful red eyes instill fear into anyone who beholds them. A Lunatone appeared during a flashback in The Redemption as one of the many Pokémon fighting in the great war of Kalos, 3000 years previously. Lunatone in Let's Play the Pokémon Card Game XY! Manabu used a Lunatone in Let's Play the Pokémon Card Game XY!. 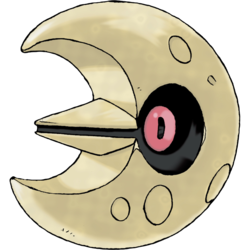 As in the games, one of Liza's main Pokémon is a Lunatone that the twins use in conjunction with Solrock in Double Battles. Pokémon Trozei! : Lunatone is the symbol of the Phobos Battalion. Lunatone was discovered at a location where a meteorite fell. As a result, some people theorize that this Pokémon came from space. However, no one has been able to prove this theory so far. Lunatone becomes active around the time of the full moon. Instead of walking, it moves by floating in midair using telekinesis. 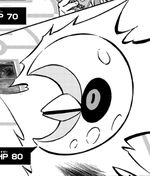 The Pokémon's intimidating red eyes cause all those who see it to become transfixed with fear. It becomes very active on the night of a full moon. This Pokémon was first discovered 40 years ago at the site of a meteor strike. Its health ebbs and flows with the lunar cycle. It brims with power when exposed to the light of the full moon. Because it turns active on nights of the full moon, it is said to have some link to the lunar phases. It was discovered at the site of a meteor strike 40 years ago. Its stare can lull its foes to sleep. The phase of the moon apparently has some effect on its power. It's active on the night of a full moon. Lunatone was discovered at a location where a meteoroid fell. As a result, some people theorize that this Pokémon came from space. However, no one has been able to prove this theory so far. Lunatone becomes active around the time of the full moon. Instead of walking, it moves by floating in midair. The Pokémon’s intimidating red eyes cause all those who see it to become transfixed with fear. Moves marked with a superscript game abbreviation can only be bred onto Lunatone in that game. 51%-100% HP The power of the moon is my power. Level up Leveled up! The moon's power rises. Can replace some disruptions with this Pokémon. For other sprites and images, please see Lunatone images on the Bulbagarden Archives. Lunatone shares its category with its counterpart Solrock. They are both known as the Meteorite Pokémon. Both Lunatone's and Solrock's stats mirror each other in perfect opposites. In the "Items" section of the DP Official Guide Book, Lunatone's name is misspelled as Lunastone. Lunatone is based on the moon, as well as a meteorite. Lunatone is a combination of luna (Latin for moon) and stone. Mandarin Chinese 月石 Yuèshí Literally "Moon stone"